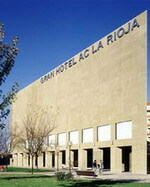 The F&G Logroño hotel is located in Logrono, Spain, known as the capital of the Rioja region. Famous for its red wine, Rioja has several vineyards, including Haro and Briones, both within 45 kilometres. A sandstone building with tiled roofing, the F&G Logroño has an elegant lobby with stone archways. There is a gym with jetted tub and sauna at the F&G Logroño. Internet access is available in the lobby. Garage parking is available on site. The F&G Logroño has a restaurant serving modern European cooking, which is open for breakfast, lunch, and dinner. There is also a hotel bar. Room service is available (limited hours). The hotel has a meeting room with audio-visual equipment. It is also located near the city's large conference hall. The newly built hotel AC La Rioja, with its modern appearance and minimalist stylish decor, is located in the centre of Logrono, the capital of La Rioja. 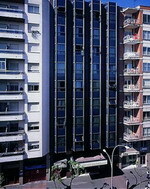 The hotel is opposite the Congress Palace and near the universities. Guests can dine in the hotel restaurant, open for breakfast, lunch and dinner and offering traditional and nouvelle cuisine dishes accompanied by a wine list with over 120 local and international wines, of course including Rioja. After a busy day, guests can unwind in the indoor swimming pool, sauna and fitness centre. The hotel also offers an array of amenities including 24-hour room service and front desk, childcare facilities, a concierge and multilingual staff. Business guests can make use of the business centre and services before relaxing in the lounge bar with a book from the hotel library and sampling a glass of local wine. 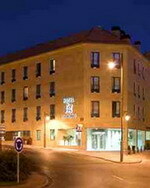 The Husa Bracos is located in Logroño, Spain, 100 metres from the city centre, and 200 metres from Logroño Cathedral. Logroño train station is one kilometre away. Complimentary newspapers are available in the Husa Bracos lobby bar, and there is a restaurant on site serving international dishes. High-speed Internet access is provided throughout the hotel and three meeting rooms cater to business guests. Further amenities include room service, safe-deposit boxes, and a 24-hour front desk. Parking is available nearby for a surcharge. Decorated in warm tones with patterned fabrics and dark wood furnishings, all the air-conditioned guestrooms have satellite television, high-speed Internet access, direct-dial phones, and minibars. Bathrooms offer hair dryers and telephones. The Hotel Husa Gran Via is a modern property located close to Logroño old town, 400 metres from the cathedral, and situated in the heart of the Rioja wine route. The centre of the old town is only 400 metres away and guests can visit the La Redonda cathedral and the La Rioja Museum. Logroño Agoncillo Airport is 18 kilometres away with an approximate driving time of 15 minutes. Business guests can enjoy access to meeting rooms accommodating up to 150 people for conferences, meetings and banquets. Drinks are served in the lobby bar and 24-hour room service is available. Guests can benefit from private onsite parking. This 8 floor hotel features 91 guestrooms simply decorated in light tones with modern wooden furnishings, striped wallpaper and linens. 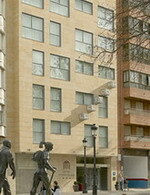 The Hotel Portales is located in Logroño, Spain, directly on the Camino de Santiago pilgrimage route, 100 metres from the Santa Maria le Redonda Church, and 100 metres from shops.This modern hotel features a contemporary lobby with pale terracotta walls, white settees, and cool stone floors. Amenities include garage parking (surcharge), and wireless Internet access in public areas. There is a coffee shop at the hotel, and breakfast is served at a surcharge. Business facilities include an onsite business centre. 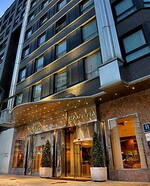 There are 48 air-conditioned guestrooms on six storeys with modern, functional decor. All are equipped with high-speed Internet connections, and televisions. Bathrooms include hair dryers. 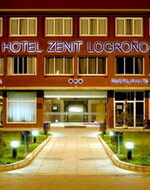 The modern, functional Hotel Zenit Logroño is set in the Polígono Cantabria business centre located 1.5 kilometres from Logroño. Nearby attractions include the Olarra wine cellar which is two kilometres away, and the ancient towers of Laguardia which are 16 kilometres away. Guests can enjoy continental breakfasts until 11 AM and light snacks throughout the day in the cafe. In the evenings, guests can relax in front of the television in the lounge, check emails using free Internet access or catch up with complimentary newspapers. Main meals are served in Malvasia, an elegant restaurant featuring various regional specialities. Guests with cars will find free parking while business travellers may hire fully equipped conference rooms which can seat up to 70 delegates. Additionally, wireless Internet covers all areas of the hotel. La Rioja is a region of northern Spain and is bordered entirely by the regions of Navarre, Basque Country, Aragon and Castilla Leon. Its capital is the city of Logrono and other important cities and towns in the province include Haro, Calahorra, Arnedo and Alfaro. The region is characteristically dry and arid but also has a hint of the Mediterranean and some wonderful scenery in the north of the region with its high mountain ranges. Starting from the 10th century, the region of Logrono was a constant borderland dispute between the Kings of Navarre and the Kings of Castilla. The dispute was finally settled in the late 11th century when Henry I of England awarded it to Castilla. During the Peninsular War, La Rioja was taken by Napoleonic forces and the region stayed in French hands until 1814 when Constitutional Cortés declared La Rioja as an independent province at the time of the Liberal Constitution of 1812. It wasn't until the death of Francisco Franco that La Rioja was finally declared the autonomous community of Spain it is today primarily due to its economic distinction from the surrounding regions. Logrono is the capital city of La Rioja province. The city is the centre of the trade for Rioja wine, from which the region is most famous for. Logrono is quite a modern city built as a river port on the River Ebro that flows through the region. One of the main places of interest will be the Santa Maria de Palacio, the oldest church in the city. It dates from the 11th century and features a tall, graceful, pyramidal Gothic spire with magnificent cloisters and Romanesque features inside. Pilgrims on their way to Santiago de Compostela to visit the tomb of Saint James, traverse the river Ebro over the city's oldest bridge, the Puente de Piedra. La Rioja is not a destination for most people who visit Spain, but one thing it does offer is some of the finest wines in the world. Haro is the main wine town of Rioja and wine making here dates back to Roman times. Life in Haro revolves around wine and on the major feast day of 'The battle of the wine', locals are happy to dowse one another with the stuff. Many of the wine cellars near Haro are situated around the station, and there is also the Wine Museum to visit for those interested in finding out more. Just 20km south of Santo Domingo de la Calzada can be found the town of San Millán de la Cogolla. The town is named after Saint Emilian who was born in 473. He was a shepherd who later became a cave hermit living to the ripe old age of 101. Many miracles have been attributed to him following his death and his tomb soon became an important place of pilgrimage. The town also contains a couple of monasteries including the 'Monasterio de Suso' with fine Visigoth and Mozarabic features, and the 'Monasterio de Yuso' which contains the first written example of the Castilian language by a monk in the 10th century when he lapsed into the vernacular whilst writing Latin text.